Recently I was asked in an interview if, even as a child, I always wanted to be a children’s author. And after a bit of thought, I answered no. When I was a child what I really wanted to be was Wonder Woman! I had her twirl perfected and everything. Activating her super powers, I would spend hours with friends, or sometimes alone, creating fantastic make-believe scenarios. These were the plot lines that brought wonderful play worlds to life. The POWER of the KID-FRIENDLY PROBLEM: Losing a favorite toy, wanting a cookie, being afraid of a storm, not wanting to take a bath. These are just a few examples of kid-friendly problems in the books we read. A kid-friendly problems connects the reader to your story. The POWER of PICTURES that ADD: The hallmark of picture books, of course, is that they are illustrated. But there’s more. Good picture book writers let the pictures tell part of the story. Sometimes the pictures even include important details that are not in the text. (See Mo Willem’s KNUFFLEBUNNY for a great example of this, or GOODNIGHT, ARK for that matter.) As you write and revise your stories, put stars next to parts of the story that could be told (or enhanced) by the illustrations. Then consider omitting the words from the text, instead substituting a simple illustration note, but only if absolutely necessary. The POWER of HUMOR: Kids love to laugh, or at least chuckle, and so do parents. So anytime you can infuse humor into your story, via text or illustration, go for it! PICTURE BOOK WRITERS: Activate your SUPER POWERS! A week ago Friday, I spent a delightful morning talking about writing picture books with 3rd through 8th graders at a “Meet the Experts” symposium organized for our town’s gifted program. Since students in the program will be writing their own picture books, I focused my session on what makes picture books engaging. During our time together we focused on four qualities and had a wonderful time looking for them in the sample picture books we read together. I then challenged them to incorporate these qualities into their own writing. The POWER of PICTURES that ADD: The hallmark of picture books, of course, is that they are illustrated. But there’s more. Good picture book writers let the pictures tell part of the story. Sometimes the pictures even include important details that are not in the text. (See Mo Willem’s KNUFFLEBUNNY for a great example of this.) As you write and revise your stories, put stars next to parts of the story that could be told (or enhanced) by the illustrations. Then consider omitting the words from the text, instead substituting a simple illustration note, but only if absolutely necessary. When I was little, Robert McCloskey’s BLUEBERRIES FOR SAL was my all-time favorite read-aloud book. Like little Sal, not only did I love blueberries, but I thought my mother and I looked a lot like Sal and her mother. I never tired of hearing how Sal and her mother got mixed-up with a bear cub and her mother while picking blueberries on Blueberry Hill. Re-reading this old favorite as an adult, I realize the magic behind that story is its parallel structure. In parallel story structure two story lines run side by side within the text by means of alternating page spreads and/or alternating texts. Unlike true parallel lines, however, the story lines in these books always intersect at some point. The parallel structure picture books I read shared some, or all, of the following characteristics. PARALLEL DESIRE/PROBLEM Giving the characters in the parallel stories a common problem or desire is the first, and most important, ingredient in good parallel storytelling. It’s the key that links the two story lines and gives the story its heart. In BLUEBERRIES FOR SAL, both mother/child pairs want to gather blueberries for winter. In SNOW GLOBE FAMILY, by Jane O’Connor, both families desire a big, exciting snowstorm. In THE DOG WHO BELONGED TO NO ONE, by Amy Hest, both the girl and the dog are lonely. This shared desire/problem provides the author a wonderful, and natural, way to instill empathy in young readers or simply to instill an awareness of “other” versus “self” and the idea that others have thoughts/feelings just like we do. PARALLEL WORD CUES One way to facilitate parallel storytelling is to use transition words such as “meanwhile”, “also”, and “too” to indicate each time the tale switches. This strategy had a particularly humorous effect in MEANWHILE BACK AT THR RANCH, by Trinka Hakes Noble, because it highlighted, in an almost dead-pan way, the hilarious contrast between what was happening at the ranch with what was not happening elsewhere. PARALLEL SENTENCE STRUCTURE Using similar sentence structure is another effective, and very poetic-feeling, way to create a sense of connectedness between the parallel story lines. The opening of Jane O’Connor’s SNOW GLOBE FAMILY is a perfect example. Spread one reads: “In a big house on a hill lives a family – a mama, a papa, a boy, a girl and Baby.” Then, with similar structure, spread two reads: “”Inside the snow globe lives another family. A very little family – a mama, a papa, a boy…etc.” This echoing continues throughout the text. PARALLEL ILLUSTRATIONS Parallel illustrations are another way to convey contrasting yet, connected, story lines. In the books I read, this was done the most beautifully in Debi Gliori’s THE SNOW LAMBS, a heartwarming story about a little boy waiting at home, wondering if his sheepdog is safe in the storm. With no parallel text, the sheepdog’s story is told exclusively through the illustrations, which parallel perfectly what the boy is worrying about in each spread. Having pondered the intricacies of parallel structured stories, I now challenge you to brainstorm plots that might be enhanced by a parallel form. Then get writing! And if you have any parallel structure picture book titles to add to my list (which is posted above under the tab STORY STRUCTURE INDEX), please let me know. ABC picture books seem like such an old standby – ever popular, yet so seemingly “done” – that I wondered as I embarked on this month’s story structure, if it was even worth examining them. After all, just how many new twists can there be on alphabet books? To answer that question and to crack the code on ABC story structure I read as many ABC picture books as I could, striving for a diverse sampling including old classics, as well as newer publications. In case you are interested, I’ve posted the ABC titles I read under the tab Story Structure Index. ABC picture books use the alphabet in several ways. The goal of many ABC picture books is simply to teach preschoolers the alphabet in a fun, colorful format. These ABC picture books lack a traditional story arc, instead relying on some fun theme to keep young letter learners engaged. Tasha Tudor’s now classic A IS FOR ANNABELLE, in which two girls dress their grandmother’s doll using items that begin with each letter of the alphabet, is my childhood favorite of this type. For a more contemporary example, I enjoyed Denise Fleming’s ALPHABET UNDER CONSTRUCTION (Henry Holt and Co., 2002) in which a mouse constructs a new letter of the alphabet on each page from “found” materials. Though there is some overlap with this and the primers above, the main difference with most ABC books of this type is that the primary goal is not to teach the alphabet. Instead, they use the alphabet as an organizational tool. These books are geared to slightly older readers, who already know the alphabet, and are ready to dig into high interest topics broken into 26 related subtopics delivered in alphabetical order. Nancy I. Sanders D IS FOR DRINKING GOURD: AN AFRICAN AMERICAN ALPHABET (Sleeping Bear Press, 2009) is a top-notch example of this type, as is Liz Murphy’s ABC DOCTOR: STAYING HEALTHY FROM A TO Z (Blue Apple Books, 2007). My favorite ABC stories, however, cleverly incorporate the alphabet within a traditional story arc. The plots of these picture books stand alone, independent of the alphabet. The letters, however, add a fun extra layer to the story, teaching kids their letters by clever immersion within the text. My favorite example of this ABC type is Michael Rosen’s AVALANCHE (Candlewick, 1998), in which a rolling snowball wreaks hilarious havoc as it rolls ever bigger through town. In addition to being an ABC text, Rosen’s story is also cumulative which gives it yet another layer of reading appeal. I also enjoyed Susan Heyboer O’Keefe’s HUNGRY MONSTER ABC (Little, Brown and Company, 2007), a delightful rhymer in which hungry monsters interfere when a boy attempts to teach them the alphabet. Finally, check out Kelly Bingham’s Z IS FOR MOOSE (Greenwillow Books, 2012) for a clever spoof on the traditional ABC primer in which Moose keeps wondering when his part is. Now that I’ve investigated the ABC structure, I happily conclude that it is still possible to write and sell an ABC picture book. What you need, however, more than ever, is a fresh take. Want to give it a try? If so, I challenge you to pick an ABC style that appeals to you and write your own ABC picture book. That’s my plan! Enjoy! Last summer in my “Picture Books with P.U.N.C.H.” post, I reflected on five characteristics essential to good picture book writing. In response, illustrator Julie Rowan- Zoch kindly designed a badge for me that conveys those five characteristics visually (See sidebar). Now, as an extension, I’ll be delving into different picture book structures. This month I’m focusing on one my favorites – cumulative stories. To crack the code on cumulative story structure I first gathered as many picture books as I could, striving for a diverse sampling including old classics, as well as newer publications. I read over 20 cumulative stories and have posted the titles separately above. I’ll be adding structures and titles to that list as the year progresses, so keep checking back. In cumulative picture books, the plot builds on itself, sort of like a rolling snowball, until it either explodes into a hilarious finale, or quietly comes to rest with a cozy conclusion. The stories I read accomplish this in two basic ways. One way to create a cumulative story is to build upon a growing set of repeated phrases. Classic examples of this structure include “The House that Jack Built”, “The Twelve Days of Christmas”, and “There Was an Old Woman Who Swallowed a Fly”. Because the plot thickens via repeated phrases, this structure lends itself well to rhyme and if executed in perfect meter, the words practically sing off the page. Jean Reidy’s LIGHT UP THE MOON (Disney Hyperion, 2011) is a poetically perfect example of a cumulative text executed in the style of “The House that Jack Built”. Two other stand-out examples of modern variations of traditional “repeat and rhyme” stories are THERE WAS AN OLD MONSTER! by Rebecca, Adrian, and Ed Emberley (Orchard Books, 2009) and Cindy Szekeres’ adorable THE MOUSE JACK BUILT (Scholastic, 1997). The challenge with the “repeat and rhyme” structure is that the repeated phrases risk becoming cumbersome, thus dragging the pace. The secret is to keep your text lean and light, perhaps varying the wording just a bit as the list builds. Another strategy is to break the list pattern midway so that the cumulative effect continues, without having to repeat the entire list. Shirley Neitzel’s THE JACKET I WEAR IN THE SNOW (Greenwillow, 1998) and Cindy Szekeres’ THE MOUSE JACK BUILT both use this strategy effectively. A second cumulative story structure is to build a plot that compounds without the use of a repeating list. This economizes on words, thus giving the writer more room within the word count to intensify the plot. This is typically done with fast paced cause and effect scenes that rely on humor and/or increasingly hilarious ridiculousness as they build towards a spectacular finale. “Just plain built” cumulative stories can rhyme or not. Either way, they are characterized by their omission of a growing written list. That list is simply understood. My favorite recent example of a non-rhyming “just plain built” cumulative story is STUCK, by Oliver Jeffers (Philomel Books, 2011), in which a boy’s kite gets stuck in a tree. To extract the kite, he tosses up ever bigger/ more ridiculous items which get stuck too. For a “just plain built” cumulative example that rhymes, I enjoyed Karma Wilson’s WHOPPER CAKE (Simon and Schuster, 2007), in which Grandpa bakes Grandma a ridiculously enormous birthday cake. Now that we’ve cracked the code on cumulative story structure, I challenge you to pick a cumulative style that appeals to you and write your own cumulative picture book. Have fun! And, if you’d like to suggest any other cumulative picture book titles, I’ll add them to my reading list and my index. Thanks! As part of my goal to read and analyse 40 picture books this summer, I’ve been participating in Nancy I. Sanders PICTURE BOOK CELEBRATION. 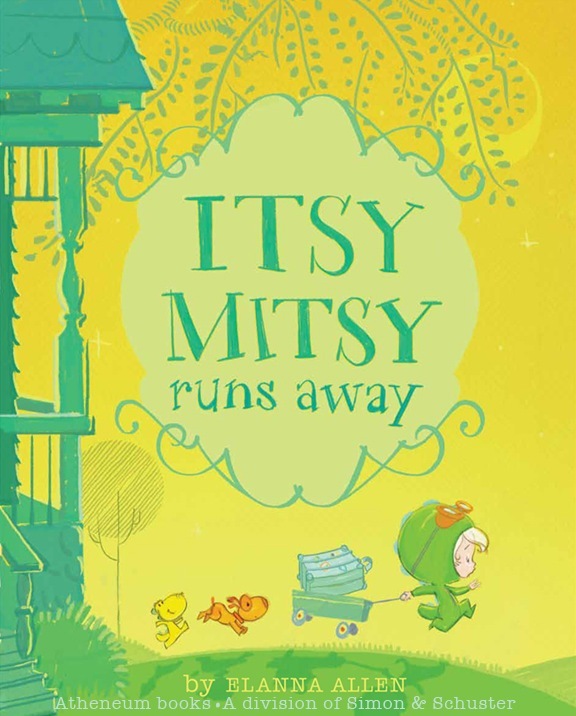 So far, I’ve read the recent Caldecott winners as well as many freshly published gems, including one that was just selected by Bank Street as one of the top picture books of 2012 – ITSY MITSY RUNS AWAY by Elanna Allen (Atheneum Books for Young Readers, 2011). From a writer’s perspective, ITSY MITSY RUNS AWAY is the model of a perfect picture book. For starters, Elanna Allen wastes no time jumping into the story. In 27 words, she establishes not only the setting and main character, but also the problem: Itsy Mitsy hates bedtime… so she decides to run away. Then, with plucky sparseness, she builds her conflict using quick paced sentences, page turns, and humor. But Elanna’s text is more than just sparse, it’s also carefully chosen. Throughout the story, Elanna uses very few adjectives, instead opting for vivid verbs and nouns that kids can really chew on. When departing, Mitsy asks her dad to “step aside”. Later, she’s afraid of the “bedtime beasties” so she packs her dog, “Puptart”, to “bark at the beasts”. Even the main character’s name is carefully chosen. Not only does the internal rhyme make me smile, but in two tight words, it conveys Itsy Mitsy’s essence. She’s a little person with a big personality. The effect: every word in Elanna’s story is so well-chosen and placed that it flows like poetry. Finally, as a graduate of Brown and the Rhode Island School of Design, Elanna is one of the ultra-talented few who write and illustrate their stories. She takes full advantage of her combined talents here. Each delightful, cartoon-like illustration enhances the story. It’s her illustrations, not the text, that confirm Mitsy’s spunky personality. Likewise, the humor of her bedtime exodus is enhanced by Elanna’s increasingly precarious (and hilarious) illustrations of Mitsy’s itsy-bitsy wagon laden with bedtime essentials. As picture book writers, we can learn something essential here. To write a successful picture book, we need to think like illustrators. We need to view our text as the backbone of the story, and let some of the details be fleshed out in the illustrations. For me, practicing this comes naturally, since my mother is an artist and I grew up drawing. But it’s something that I need to remember and play upon as I write. CHALLENGE: This week pick a favorite picture book and transcribe it so you see the text only. Then write down all the ways the illustrations enhance and flesh out the story. Finally, think like an illustrator as you revise and/or write your own picture book draft. Picture Books that Pack a P-U-N-C-H!